The Nissan 280ZX (internal model code "S130", also sold as the Datsun 280ZX and Nissan Fairlady Z, depending on the market) was a sports coupé produced from 1978 to 1983. It was the second generation Z-car, replacing the Datsun 260Z/280Z in late 1978. The 280ZX was the first time where the "By Nissan" subscript was badged alongside the Datsun logo, along with the Nissan trucks. 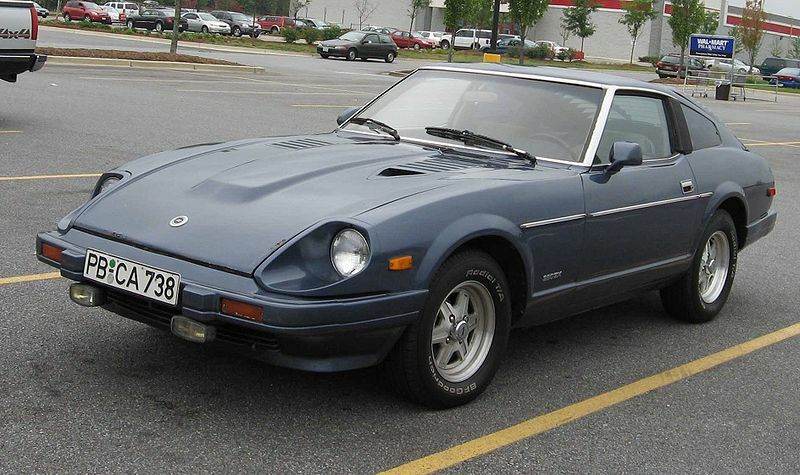 The 280ZX was Motor Trends Import Car of the Year for 1979. The 280ZX was replaced by the Nissan 300ZX in 1984. The 280ZX was a complete redesign, retaining only the L28 inline-6 engine and other driveline components from the 280Z. Both two-seater and four-seater (2+2) designs were offered. With a focus on the oil crisis of the late 1970s, Nissan improved fuel economy, emissions, and aerodynamics over the first generation Z-Cars. In addition, high-end audio systems were standard. The 280ZX adopted suspension similar to that of the concurrent Bluebird 910, with MacPherson struts in front and semi-trailing arm independent in the rear. The wheelbase was up from its predecessor (90.7 in (2,304 mm)) to 91.3 in (2,319 mm) for the two-seater. The 280ZX's body was redesigned with aerodynamics in mind. By closing in the open grille of the first generation Z-Car and through other improvements taken from wind-tunnel testing, the drag coefficient was reduced from 0.467 to 0.385, and the lift coefficient from 0.41 to 0.14. The new design had a lower center-of-gravity and near 50/50 weight distribution in both 2-seater and 2+2 designs. The rear of the car was stretched to accommodate a larger 80 L (21.133 U.S. liquid gallons) fuel tank. Overall, the new body design gave better fuel economy and high-speed stability (one of the known issues from the first generation Z-car). Improvements were also made to braking, and steering. The 280ZX initially offered either unassisted rack-and-pinion steering, or Datsun 810-derived recirculating-ball with power assistance. A new power-assisted rack-and-pinion replaced the recirculating-ball steering system for the 1981 Turbo, becoming available on the normally aspirated models the following year. It is a common misconception that the 280ZX's L28 engine is less powerful than the L24 engine of the 1970 240Z: the difference is due to Nissan adopting the SAE net standard of power measurement, which resulted in lower power ratings than the earlier gross figures and added emissions. However, Nissan designers deliberately sacrificed raw acceleration for improved fuel economy in the 280ZX, so the early 1979 models rated at 145 hp (108 kW) actually had slower acceleration than the 240Z, largely due to increases in weight and emissions control strangling. This overall performance deficit was not addressed until the release of the 280ZX Turbo in 1981. The 280ZX was branded in the American and Australian markets as the Datsun 280ZX; and in the local Japanese market as the Fairlady Z. In the 1979 model year in the American market, it was co-branded Datsun by Nissan through the 1983 model year. These were considered transition years as Nissan began to phase in their new global brand under the Nissan name. The Japanese market got both 2.0 L and 2.8 L engines. The 2.0 L-engined Fairlady 200Z used the L20 engine common in Nissan family cars of the same era. Export markets all got the L28-powered version. The preference for two litre engines in the Japanese market is a by-product of taxation laws. Two trim levels were offered in America, with a no-frills two-seater and the Grand Luxury (GL) ZX carrying the full equipment list. Leather seats were optional, and an optional digital instrument cluster was introduced in 1982.